You would struggle to get me more excited about an upcoming film than to compare it to All The President's Men, claiming that, like Alan Pakula's 1976 film, it captures a social zeitgeist unique in its individuality. Tell me that David Fincher's directing it and you've got a sure-fire customer. After Scott Foundas' early review which said just those things, anticipation for The Social Network reached stratospheric levels. It's testament to Foundas that the comparison between the two films is a difficult one to beat. 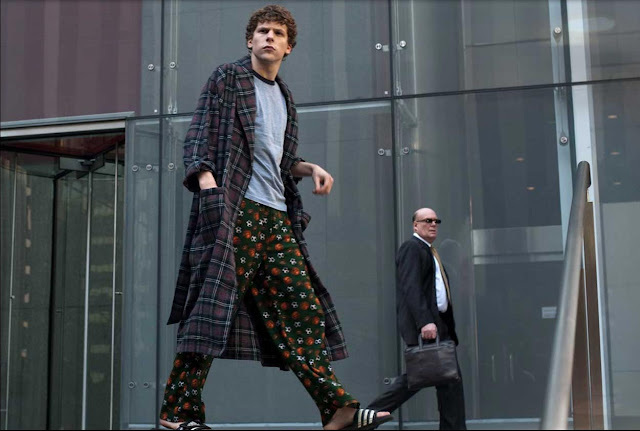 After two hours in the company of Mark Zuckerberg (Jesse Eisenberg) and assorted friends, colleagues and lawyers, I had been hooked by David Fincher's slow reveal and examination of events, just as Pakula does with his own expose. Fincher performs a balancing act of unique proportions as the vindictive and egotistic Zuckerberg is juxtaposed against friend Eduardo Severin (Andrew Garfield), wronged ex-girlfriend Erica Albright (Rooney Mara) and the possibly-even-more-depraved-than-he-is, Sean Parker (Justin Timberlake). Like any film where the focus is placed on the 'villain' it's important that you really dislike Zuckerberg. And you do really dislike Zuckerberg. The performance that Eisenberg gives is completely unexpected. A world away from the flimsy comedy of Zombieland or even his dorky student in the recent Solitary Man, his portrayal is a confident and mature stab at an over-confident and immature young man whose esoteric programming genius gives him little advantage in social situations. That the film is as much about Zuckerberg's irony-laced social failings when compared to his success in virtual society is well documented but there's something more here too. Fincher isn't content just with pointing out that the developer is a God in one world and a nobody in the other, rather he moves on to question the validity of the worlds in question: he might call Facebook The Social Network but how 'social' (or more accurately, sociable) is it really? Is proclaiming that your relationship status is 'single' on Facebook more or less valid than doing it in the real world? Is there a difference? The second of those questions is only marginally let down by the fact that it hangs on Brenda Song's considerably under-developed Christy but to anyone familiar with the site it will no doubt ring unnervingly true. Perhaps frustratingly, the director chooses not to draw many conclusions to his questions and with the final third of the film taking some wrong turns, this became the second Fincher film in three years that I've walked out of surrounded by an audience who were near-universally decrying the ending. Aaron Sorkin's script is an excellent example of clever writing which doesn't treat the audience as a bunch of idiots but his use of the Marylin (Rashida Jones) character towards the end started to reek of un-needed exposition and the fact that the Facebook story hasn't reached its real life conclusion yet is a stumbling block. Despite this though, The Social Network stands up as the zeitgeist capturing film that Foundas proclaimed it to be and whilst two hours in Zuckerberg's company is never entirely pleasant, it is most certainly compelling. Cannot wait to see this movie!! Kept getting sidelined by something weekend after weekend [sigh] That's a nice summary there in the beginning, that's the story I want to see. I haven't seen a bad review yet of this, nor of Eisenberg's performance. A few mentions how good Timberlake was, I guess I'll believe it when I see it. I'm not too fond of him in general but I'm probably in the minority. No same here, not seen any negative reviews at all. Eisenberg is great, expected him to play, well, the character that he always plays but he doesnt. I might even call him a revelation. JT is OK. I think you can tell he puts more effort in than some singers-turned-moviestars but there are obviously better actors out there. I suppose casting him as the 'superstar' of the geek/hacker/entrepenuer world has a certain meta-appeal though. I was unpolluted by a Disney-related Brenda Song. I can easily see and argument for it being a perfect film, it just wasn't quite for me. Enjoyed it immensely never-the-less. Good review.My only problem was that the film was based on Eduardo Saverin's story so I felt it was slightly unbalanced. Agree with your 4/5 though. Yes, I think you're right John but Sorkin and Fincher have pretty much said as much during interviews (Sorkin admits to 'not knowing who the real Mark Zuckerberg is') so as long as that's upfront then I don't have too much of a problem with it. You're right though: the film has an agenda and it's definitely pro Severin, anti Zuckerberg. Hmmmmm...I read 'The Accidental Billionaires' so I have definitely sided with Eduardo Saverin, even though I know there are two sides to every story. I cannot wait to see this film...I have 19 days to go (I think) until it comes out here! Keep counting those days down Stevee - I'm sure you won't be disappointed! The opening shots of Zuckerberg running through the campus with the off-kilter score in the background are worth the admission price alone. i really hate facebook. blech. it annoys me to know end and gave my computer a malware worm! BUT this movie looks really interesting! thanks for the review! When I first had Facebook it was incredibly useful, now it's more like an admin task just replying to requests, etc. The movie works whether you like the site or not - beyond that, it works even if you don't really have any prior knowledge of the site. Thanks for the link, Sam - superb review, and I note that I neglected to comment on Christy's character - she's a bit too one note, I agree, and would probably constitute one of the film's very few failings. And you are right - you really do dislike Sean Parker. Kudos to Timberlake on that score. Given that he is the film's unquestioned bad guy, do you think Metallica could have pumped a little money into the piece? If not they missed a brilliant opportunity! No problem with the link. This film is not on FB. It is a social commentary about the world in which we live I think most people do not "get" this yet. Fincher and, as usual, is expressed in the most brutal, straight and cold as can be. I think a lot of people have mentioned it to be fair Mallika but yes, of course you're right - Fincher talks about apathy in SEVEN, about consumer culture in FIGHT CLUB and about how we interact with people in THE SOCIAL NETWORK. What sets him apart is that he makes both great morality tales and films which are great thrillers in their own right. Cheers Dan. You're absolutely right. Re-wind the clock a year or two and people were wondering what the hell Fincher was doing taking on a film about Facebook. Good on him for making something so amazing and I'm with you - I hope it gets some love from The Academy.